Conserve valuable PCI slot space in servers, alleviate bottlenecks, and increase uptime with Gigabit performance for servers in multi-mode fiber-optic networks. The Intel® PRO/1000 MF Dual Port Server Adapter, with a selfconfiguring PCI/PCI-X interface, delivers high throughput while conserving CPU resources. 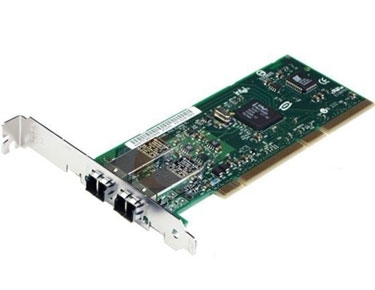 Enhance server performance further by teaming these two connections together or with other Intel® PRO Server Adapters using Intels advanced server feature software to achieve multi-Gigabit scalability and redundant failover capability. A compact form factor and swappable low-profile bracket allow this dual port Gigabit adapter to fit in even high-density, rackmounted 1U and 2U servers. With a flexible design that fits almost any type of PCI bus, the standardsbased management features and wide network operating system support help to ensure extensive compatibility with the latest server and networking environments.